Welcome to Stop 20 & Chapter 20 of the Consequences Audio Tour! 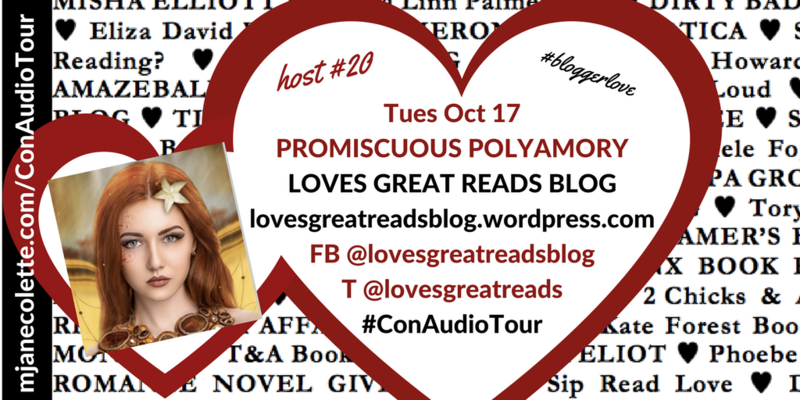 If you’re in a hurry to listen to Chapter 20: PROMISCUOUS POLYAMORY, hurry over to LOVES GREAT READS BLOG RIGHT NOW! Me: Run run to LOVES GREAT READS BLOG to find out! Got a few minutes? Please, meet the Faerie Bookworms of Loves Great Reads Blog! Loves Great Reads Blog is the love labour of El and Kel (also known as the Faerie Bookworms), who believe some of life’s greatest adventures are found in the books we treasure. Kel also works as an author’s PA, and based on the support she’s given me on this tour–friends, check this hardworking Book Faerie Out! Connect with Loves Great Reads Blog on Facebook, Twitter & Tumblr, and find Kel on Twitter & Facebook. I am so very very grateful they accepted my invitations to be part of the Consequences Audio Tour, and I hope their readers enjoy the very complicated coming of age (twice) Promiscuous Polyamory chapter. Thank you, El, Kel & Loves Great Reads Blog​! The rest of you… why are you still here? Run, run, RUN to Loves Great Reads Blog and listen to Chapter 20: PROMISCUOUS POLYAMORY.